Chockfull of fresh ingredients, this colourful salad gets an extra boost of flavour from the smoky barbecue sauce. Mix oil, sugar, vinegar and 1/4 cup barbecue sauce until blended; reserve for later use. Mix remaining barbecue sauce with lime juice and chipotle peppers until blended; brush onto chicken. Place chicken, corn and pineapple on barbecue grate. Grill 5 min., turning pineapple occasionally. Transfer pineapple to cutting board. Continue to grill chicken and corn 8 to 10 min. or until chicken is done (165ºF) and corn is tender, turning chicken after 5 min. and turning corn occasionally. Transfer chicken and corn to cutting board; cool slightly. Cut chicken into thin slices, then cut each pineapple ring into 4 pieces. Cut corn into 1-inch thick rounds. Cover platter with lettuce. 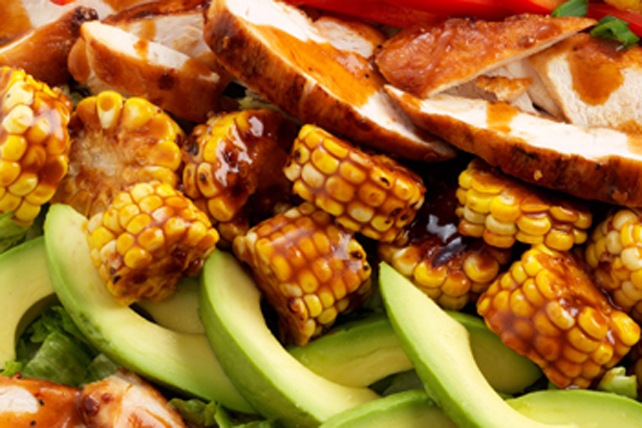 Arrange chicken, corn, pineapple, avocados and sweet peppers in rows over lettuce. Sprinkle with onions; drizzle with reserved barbecue sauce mixture. Serve with lime wedges for squeezing over the salad just before serving.